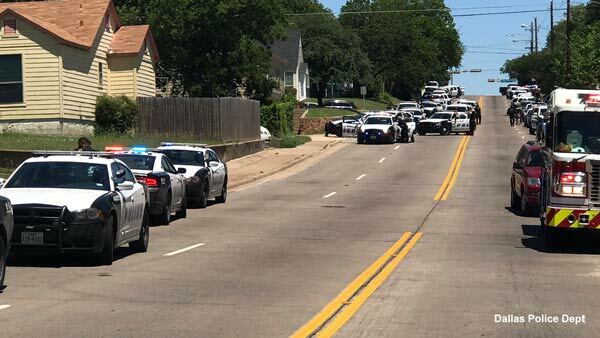 DALLAS -- A Dallas paramedic is in critical condition after being shot while responding to a shooting call, and that the scene remains active and dangerous. The city released a statement saying officers were responding to a shooting around 11:30 a.m. Monday when a Dallas Fire-Rescue EMT Unit was struck. Dallas police say a paramedic was hit and is hospitalized in critical condition. We have PIO headed to the scene, we can confirm one member of Dallas Fire Rescue has been shot and transported to a local hospital. Authorities say the shooting occurred near the Dolphin Road Fire Training Academy east of downtown. Dozens of police vehicles have swarmed the mostly residential area. Police spokesman Warren Mitchell says "the entire area is still active and very dangerous." No details have been released about the shooter or what may have sparked the shooting. The Dallas Police Association tweeted earlier Monday that officers responding to an active shooter were "pinned down" by gunfire. There is another active shooter in Dallas. This time a fireman has been shot, and officers are pinned down by gunfire. Please pray!